BRAND NEW UPDATED BOOK BY PASTOR GERRY! Do you remember being in your mother’s womb? Try backing up even further…Do you remember being with God at the beginning of the creation–in Eden? Many believe we will live beyond this life, but cannot conceive of our existence prior to being born. The Bible tells us we were created by God…then we disobeyed God and fell, and we are now born into this existence for a purpose (Eph. 1:4-5, 11). The purpose–to be reconciled and restored back into a relationship with God again. The Church today complicates our understanding with concepts of “Federal Headship”– with Adam being responsible for our being sinners. The Church today tends to focus on how to live and get along in this world, and often neglects our need to reconcile with God, and our true need for a Savior to accomplish this. The Bible clearly teaches the truth. But, just as the disciples had to search the scriptures to understand the riddles, puzzles, or parables of Jesus (Numb. 12:8, Isa. 45:15, Matt. 13:9-17), so too, we must also search. There is a simple test in the first chapter on “The puzzle of God’s Word,” which you can take to be convicted of our need to understand the truth of the two creations (Eden and the 7-Day). Understanding the two creations is the foundation to understanding why we are separated from God at birth, and face death today. In the original edition of Eden to Evil, Pastor Burney explains the difference between the two creation accounts, the “Eden” creation and the “7-Day” creation. They diverge in so many ways that many believe both cannot be true. Did God make a mistake—and how do we fit into the two accounts? But, if the two accounts were not a mistake, then God must have given us a riddle that only those who search for truth will uncover. Pastor Burney deciphers the riddle to show how the answer helps us understand the Bible, and how we view ourselves. Are we sinners, or saints? In this new updated edition, Pastor Burney builds on his original book, clarifying why a third of the angels rejected God’s authority, thus exposing how early civilizations so easily accepted Satan the serpent. Now we can finally understand why we experience suffering and tragedy in God’s “very good” creation, and why we need a Savior. This book is only available through our prison ministry web site—TargetTruthMinistries.com. 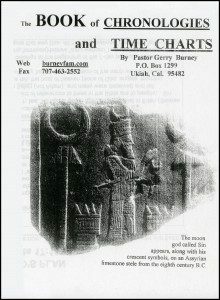 The Book of Chronologies & Time Charts is a series of time lines and is extremely helpful to anyone interested in understanding the Bible, history, and how the end times will unfold. The first timeline covered is creation, and the two Genesis accounts of creation—which one should actually be first? Next is a flow chart of the families and nations which followed Noah’s generations. Discover the time line of the Bible itself in great detail, including the Jewish texts, the bishop structure, the early church formation, and cultic threats. There is an Earth time chart depicting three columns: The biblical account from creation to present—The scientific hypothesis—And, the actual scientific evidence for age. Discover the history of the Fertile Crescent—Palestine or Israel? See how the world’s empires developed in history and the Bible’s link to them. Here, science, archaeology, the Bible, and astronomy combine to give us a clear history of empires from the very beginning to today. Follow a scenario of how the end times will unfold—a chronology from 1948 to the New Heaven & Earth. This section uses the whole Bible to develop a detailed chronology of end time events to the very end. This is a comprehensive study aid everyone can easily follow and comprehend. Again, The Book of Chronologies & Time Charts is only available through our prison ministry web site. Visit our web site to support our prison ministry—TargetTruthMinistries.com. Please leave us any feedback you may have in the “Comments” box!